'The Recovering' Chronicles Addiction In Lush, Caressing Detail Author Leslie Jamison's new memoir of her years of alcoholism walks in the paths of drunken icons like Raymond Carver and John Cheever, describing the effects of intoxicants with gorgeous, exact care. "With a good feeling, it was always: More. Again. Forever." 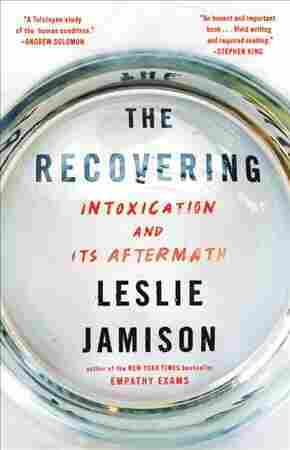 Leslie Jamison's memoir The Recovering: Intoxication and its Aftermath follows the story of her alcoholism in lush, almost caressing detail. "I mashed the lime in my vodka tonic and glimpsed — in the sweet spot between two drinks and three, then three and four, then four and five — my life as something illuminated from the inside." It wasn't just the drinking she loved: it was the idea of drinking. When her drinking got really bad, she was at the Iowa Writers' Workshop, spending her days "reading dead drunk poets and my nights trying to sleep with live ones. I love-groped my way through the future canon." In Iowa she walked behind the swaying, broken ghosts of Denis Johnson, Raymond Carver, John Cheever, and John Berryman: "I idolized the iconic drunk writers because I understood their drinking as proof of extreme interior weather. It seemed generative, volatile, and authentic." But after years of blackouts, hiding empty bottles in neighbor's trash cans, and fights with her boyfriend, she finds that drinking, which promised so much, was instead "a thwarted flight into transcendence, like a dog, chained to a post, barking at the sky." Chained is the operative word: in Latin addictus means conscripted, ordered over, even enslaved. An addict is someone who has been spoken for. But recovery, too, has its scripts: Jamison's stated project is to find out "if stories about getting better could ever be as compelling as stories about falling apart. I needed to believe they could." That, it turns out, is not her problem: Her sobriety stories have an awful, attractive fluorescence. Her metaphors for sobriety are always shrivelled, dried: a bitter lemon, "a mountain of dried-up tea bags," a "small, joyless clenched fist," a kiss from a "pair of chapped lips." Drinking, on the other hand, was like "having a candle lit inside of you." It "was plush and forgiving. It sparkled like backyard fireflies. It smelled like good meat and smoke. It was already happening in the nearby possible world. It said, Come on over." And let's not forget drugs: the "gracious feeling" of Ativan before a surgery, the "icy swell" of cocaine, the way pot made "strange little animals" blossom through her elbows and shoulders. When Jamison writes about drinking and drugs, and later about sobriety, it is the kind of gorgeous and exact writing that only comes from extreme attention, that greater part of love: "I was thinking about booze all the time." Other people, in contrast, exist in grayscale. "I do not know others," a drink-rotted Jean Rhys wrote. "I see them as trees walking." Jamison fears that alcoholic solipsism, and she tries to offset this by interspersing her narrative with other people's stories. The result is long, diligent sections summarizing the trials of people she met in AA or of dead strangers, which are cleanly done but have none of the "strange little animals" of her own story. It's hard not to think of the way she describes characters in her early fiction: "They were either fake, or else they were me." When I reread The Recovering, I skipped the parts about other people and found a shorter and truer book waiting inside. Her journalism is less natural than her essays, so, for instance, the reported story of a rehab house and its inhabitants feels perfunctory, a way of warding off the appearance of self-involvement. When Jamison writes about drinking and drugs, and later about sobriety, it is the kind of gorgeous and exact writing that only comes from extreme attention, that greater part of love. There is something touching about her almost academic instinct to establish a pedigree — to say "I am an alcoholic" (cf. Cheever), "I hurt" (cf. Rhys), "I'm ashamed" (cf. Berryman). When these are integrated into the main narrative, these references add texture to the book: Some of Berryman's sweat-grimed, unforgettable lines that she quotes have been playing in my head since reading them: "Are you radioactive, Pal? — Pal, radioactive. — Has you the night sweats & the day sweats, pal? — Pal, I do." But for the most part, Jamison's story was the only one I cared about, not because her drunkalog, as she calls it, is different from or better than anyone else's, but because she was so fully there, in her own thronged and fraught mind, illuminating it from the inside. She worries that that kind of interiority suggests a fatal selfishness. But the promise of books is that we are bound up and implicated in other people's lives, even if they have nothing to do with us. Her story is ours now — what a gift.